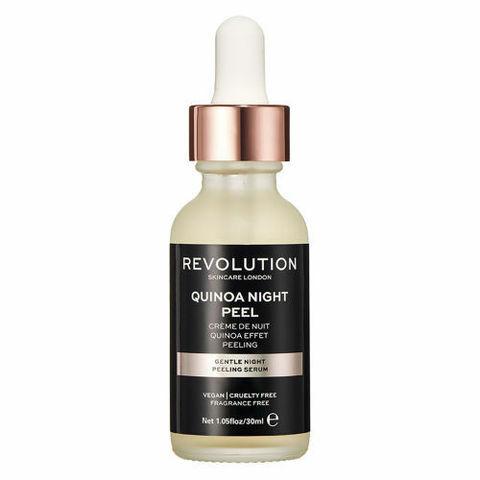 Transform a tired or lacklustre complexion with Revolution Skincare Gentle Quinoa Night Peel Cream. 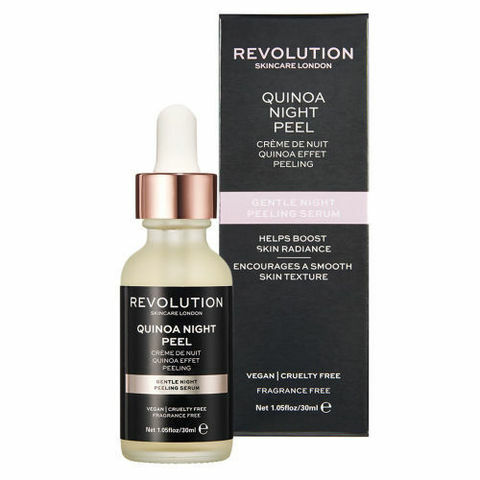 This lightweight formula lifts away dead skin cells while promoting natural cell turnover, enhanced with vitamin-rich quinoa to reveal a brighter, softer and fresher-looking complexion. Aqua/Water/Eau, Alcohol Denat., Glycerin, Propanediol, Ascorbyl Glucoside, Sodium Benzoate, Hydroxyethylcellulose, Vaccinium Myrtillus (Bilberry) Fruit Extract, Potassium Sorbate, Saccharum Officinarum (Sugar Cane) Extract, Disodium Edta, Citrus Aurantium Dulcis (Orange) Fruit Extract, Citrus Limon (Lemon) Fruit Extract, Hydrolyzed Opuntia Ficus Indica Flower Extract, Chenopodium Quinoa (Quinoa) Seed Extract, Acer Saccharum (Sugar Maple) Extract, Aloe Barbadensis Leaf Juice, Phenoxyethanol, Ethylhexylglycerin. Caution: Avoid Contact With Eyes. If Irritation Persists, Discontinue Use And Consult A Physician. Do Not Use On Sensitive, Peeling Or Compromised Skin. Sunburn Alert: This Product May Increase Your Skin’s Sensitivity To The Sun And Particularly The Possibility Of Sunburn. Use A Sunscreen And Limit Sun Exposure While Using This Product And For A Week Afterwards.